As our regular visitors know, we’ve been down for a little over a week. What started as a simple update for our site quickly grew into an unexpected server migration. A server migration for your website really is something you should plan for but in this case it was unavoidable and urgent. We do apologize for any inconvenience it’s caused for our visitors. Moving forward… There are still some things we’re moving around on the back end of the site, so some website functions and redirects may not work properly. We’re still tracking the stuff down but it all will be corrected in due course. 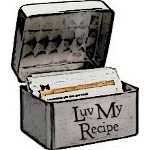 LuvMyRecipe has changed a bit so please take a moment to look around. We’ve added some updates to improve your mobile and tablet experience. Generally there should be an all around boost for all devices. We’ll be continuing our updates in the background but nothing that should adversely effect the site itself. As always, we value your patronage… thank you for visiting.